Picked a poor week to be away as regards energy news, and top of the list must be the decision of RWE and our old friend E.on not to proceed with the two nukes they were slated for in Huhne's masterplan of ten. Budge will no doubt be sad and angry in equal measure but, well what did anyone expect of this pair of cash-strapped players from the land that has just turned its back on nukes altogether ? The surprise was that they carried on with the pretence for so long. Likewise, it's mildly odd that the other equally cash-strapped nuclear pairing of Gaz de France / Suez and Iberdrola (Spain) are still ploughing on as if there is anything likely to come of it. If the French government is, for whatever reason (perhaps having its palm crossed with UK electricity customer's gold), inclined to underwrite a UK project, the vehicle will be EDF - with or without Centrica. We are not too far from the point where the government will need to signal a headlong dash for gas. The power industry is poised to respond, with already-permitted sites ready to go: it always knew this was a highly plausible scenario, if not outright inevitable. The UK system of granting consents for new power plants involves a 5-year 'free option' to build (well, not quite free, but almost), so they get their planning permission in early, and see what happens. It's not just the government that seems surprised and hurt. Gorgeous pouting Caroline Flint is 'disappointed'; and the would-be re-born UK nuclear industry (mostly the civil engineering bit of the supply chain, we can't do much else these days) is appalled - "it's a total train wreck". 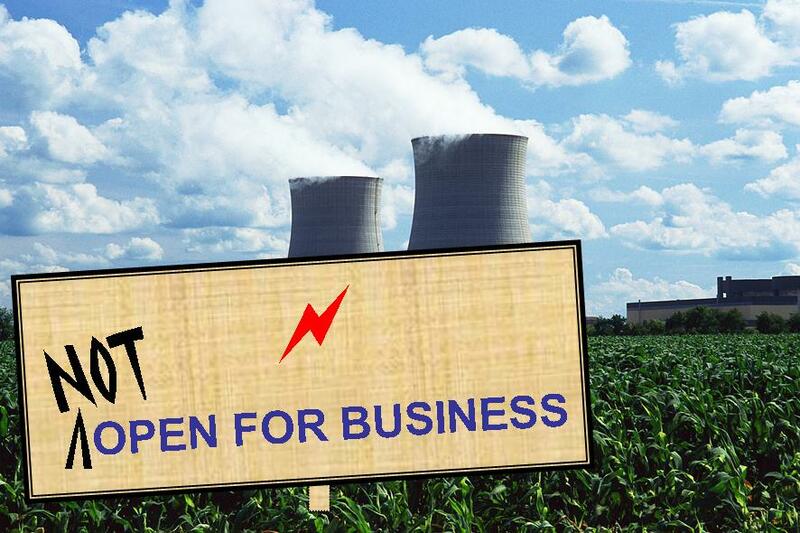 They have been led a merry dance by government and 'nuclear developers' alike, and can see it all coming to naught. But - he who would live by the subsidy must reckon to perish too, when the situation's inherent flaws become too much for the dreamers to bear. Put not thy faith in subsidies. Is this to do with the loss of Huhne? We're the builders convinced that their man was going to come up with pots of gold? I note that Japan is gearing up to restart their reactors as fuel costs are killing the economy. "I've spoken to sources at [Centrica and EDF], and they say there is a make-or-break decision to be made towards the end of the year by ministers - which is whether they are prepared to abandon their previous position that there won't be any substantial subsidies for nuclear, either from taxpayers or customers." So Hendry & Co get one final roll of the subsidy dice according to the spinners leaking to Peston. Sounds plausible. But it will be after the French election by then, and EDF may no longer be under the cosh to make work for Areva, so it may be too late even for Hendry to save new UK nuclear. NB Horizon (RWE & E.ON) were planning 4 EPRs or 6 AP1000s, making about 6,600 MWe. Half at Wylfa, then the other half at Oldbury, in the grand plan. Two sites, but more reactors. quite a game of chicken, eh ? Regarding the high costs of building a nuclear plant, what percentage of the costs is due to over regulation by government? From what I can see, if some of the regulations were relaxed it would not make the plants less safe but would reduce the cost by a reasonable amount. Yes, ND, I will bite. There are risks to Nuclear, and monitoring and alleviating those risks are what vastly increases the costs. But there are also risks to using Gas supplied by corrupt, unreliable foreign despots who at best could not care less about the UK and at worst consider us an ancient enemy. Again you are trapped by the cultural English view that Johnny Foreigner has a duty to look after us. But why should EDF or GDF subsidise UK Nuclear? Of course they want the exceptional risk costs underwritten by us - they are not charities for the benefit of the UK. And foreign despots certainly don't see it as their duty to keep our lights on. According to DECC (uses Mott McDonald) (http://www.decc.gov.uk/assets/decc/statistics/projections/71-uk-electricity-generation-costs-update-.pdf) Nuclear is more expensive than Gas (CCGT) but cheaper than anything else (Wind needs Gas back up doubling its cost). Therefore we need Nuclear in the mix. We subsidise roads. We subsidise hospitals. Why not power stations? Infrastructure will never be profitable. Long term, the countries with the most nuclear power stations will be the most prosperous. We have vast stores of nuclear fuel crying out to be used. ivan, Budgie, regulation and operational safety are quite a small expense for nuclear. The biggie is the cost of finance: loan/bond interest and equity dividends including the risk premium - i.e around 12%. In the western privatised environment cost of finance is about 70% to 75% of the per unit price of nuclear electricity. You could argue (but after Fukushima that would be a bit daft) that the improvements in physical and engineering safety of the Generation III are unnecessary and we should essentially go back to the Generation II type safety of the 1970s, which would save a bit of capital, perhaps 20%. But that would in practice be abandoning all the current western designs and nuclear companies, and saying only the Chinese (CPR1000), South Koreans (APR1400) or Russians (VVER-1000 or 1200) would build new nuclear in Europe and USA. ND, Yes, thank you, though I have mentioned Coal before. Coal and Gas suffer similar strategic problems: large volume transport and storage, wide fluctuations in fuel costs, long supply lines not controllable from the UK. Of course indigenous Shale and Coal take away some of those risks. Subsidies ... hmmm. Generally I dislike subsidies. Would I pay the slightly higher cost of some Nuclear compared to all Gas? Yes, because I regard it as insurance, not subsidy. Rwendland, I beg to differ: the entire design of Nuclear, the process, construction, operation, waste disposal and decommissioning are heavily governed by safety which adds considerable cost at every stage. You seem to be saying a level of nuclear safety/regulation roughly equiv to the 1970's, or less, is acceptable. I don't think that is a runner at all now. Other than in the design/construction of plants, any reduction in safety/regulation would only really reduce the 11% O&M costs a little - i.e. not a substantial change. Skimping on design/construction safety might save somewhere between 20% and 40% on capital I suppose, but I don't think we want to go there. Rwendland, sorry missed your reply. The high capital costs are a consequence of high build costs. High build costs are a result of the high levels of safety engineered into Nuclear plants. Don't get hung up on the accountants' views, they just run along behind the builders adding up the costs. So you want slightly modernised 1970s era reactors? The Chinese do a nice line in those (15+ building/built) - the CPR1000, a somewhat modernised French 1970s reactor. Better get your order in quick, as they will soon be moving onto western type Gen III designs. Where on earth do you get "you want slightly modernised 1970s era reactors?" from? I specified no such thing. In fact I did not specify any particular safety "level" at all. I pointed out what I previously thought was uncontroversial: that the design and build (capital) cost of Nuclear is very high because of the safety that must be incorporated from the ground up (and below it). Safety is not a matter of politicians' superficial regulations and it certainly cannot be separated out into a few cents in the dollar as though it was a bolt-on afterthought. The design and construction of a gas train is not the same as that of a sodium moderator. And it won't cost the same either, even though both need their appropriate safety requirements built in. Budgie, sorry, I thought you were talking about nuclear plant that could be deployed now by privately funded companies. I take it from your "a gas train is not the same as that of a sodium moderator" you are talking about High Temperature Gas-cooled Reactors. But someone needs to build and run for a while a demonstrable near-commercial one of those, before it could realistically be viewed as buildable by a commercial company. About 20 years into the future, maybe.